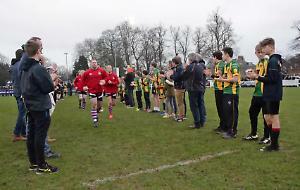 HENLEY HAWKS withstood a strong second-half fightback from Barnes to win an ultimately exhilarating, yet error-strewn contest in their first home match of the season at Dry Leas last Saturday. Barnes started strongly and were rewarded with a penalty after three minutes when Charlie Wicks kicked the visitors ahead. The game struggled to get going but a kick to the corner saw Henley work through the phases and their patience was eventually rewarded when Dave Manning crashed over following a great driving maul. Butler added the extras. A leg injury to the ever-present Tom Hall — who was celebrating his 100th cap for the Hawks — on 28 minutes saw the flanker replaced by Alex Bradley, making his first appearance for the club following his summer switch from Chinnor. With Henley Hawks now in the ascendancy, a fine team move saw winger Sam Portland cut through the Barnes defence to dot down making it 14-3. Despite the Hawks having most of the possession and territory, they couldn’t stretch their lead any further before the half-time whistle. Henley Hawks started the second half in a similar vein, showing real intent and endeavour right from the off. It wasn’t long before replacement prop Brad Cook went over in the corner following more impressive build-up play. The game had now turned into a stop-start affair and with the Hawks reduced to 14 men following a yellow card to Joe Butler, Barnes eventually got a foothold in the match. The visitors’ first try of the match was a reward for their hard work and flanker Ciaran Smyth, spotting a gap in the Hawks defence, managed to wrestle his way over the whitewash. With Henley Hawks now down to 13 men following another yellow card, this time to replacement scrum half, Ross MacDougall, Barnes took full advantage of the Hawks ill-discipline and a clever kick through from Wicks was picked up James Morgan to score under the posts. The Hawks responded well and went over for a bonus point try with the impressive Leo Webb dotting down in the corner following more good forward play. The drop goal conversion from Butler near the touchline due to the wind blowing the ball off the tee was a highlight. However, Barnes were not done yet. Danny Holmes reduced arrears again to just two points with another converted try, but Henley managed to see the clock down without any further alarm to register their second consecutive win. The win saw the Hawks move to second place in the table behind the Rams who they face at Sonning tomorrow (Saturday). Henley Hawks: Randle (Robinson, 42 mins), Wood, Morrison, Perry, Portland, Butler, Webb (MacDougall, 41 mins), Stock (Cook, 36 mins), Emery, Manning, Hyde, Albon, Lunnon, Hall (Bradley, 28 mins), Lowe. Replacements: Cook, Mason, Bradley, MacDougall, Robinson.